When I got up this morning I felt so cranky thinking about all the things I need to do in the house. My week days have been very busy lately I didn't have time in hands cleaning the house. I've been spoiling my husband lately, when I do something in the house he just sit in the couch watching his favorites show, but he does nothing! So, this morning I had a chance to tell him how I feel, I told him lately I feel so much pressure, I've been so busy in work, a lot of stuff going on seems he doesn't care. Finally, today he seems to care about me-:)So what did we do? CLEAN! Yup, we had a very busy week end. We spent most all morning cleaning the house, doing our laundry, and organized stuff in the house and even made a trip to Filipino Store which is a mile away from the house. So, at least the house is cleaner were able to relax in the afternoon. I know in time he may able to try my fish cooking when he don't have food to eat at all lol.. Anyhow, This is my own version of cooking "Sinigang". 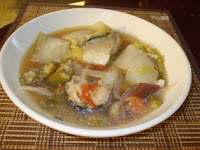 I had two sliced of "Bangus" simmered with tomato and onions for few minutes. I added okra, eggplant and chinese cabbage. 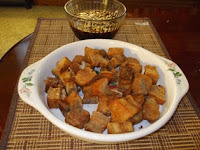 I cooked until it was done and seasoned with salt and a lil sinigang sauce. Hmmm.. Yummy!